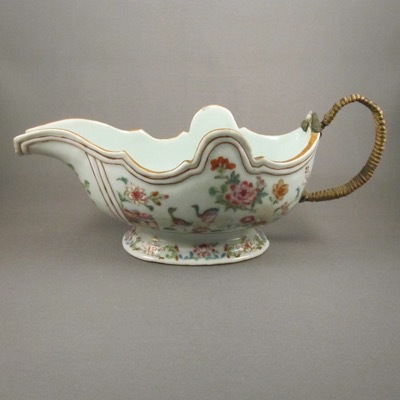 This elongated Baroque serpentine form silver shape sauce boat was made in China during the Qianlong period (1736-1796). 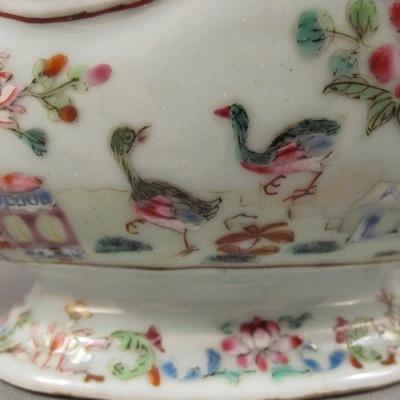 It is made of porcelain and decorated in the Famille Rose palette, with hand painted flowers, ducks, and garden stools in pink, green, blue, and white enamels with gilt highlights. 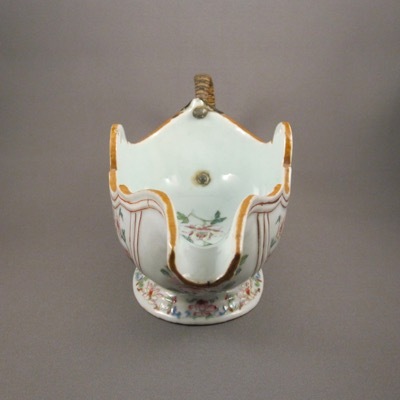 It measures 9-3/4 inches long by 3-5/8 inches high. 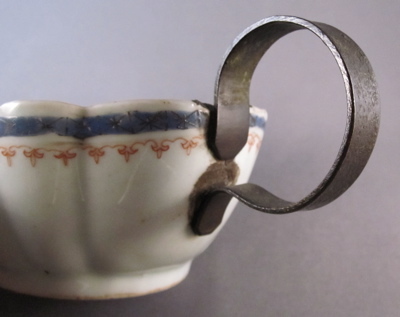 Well over 150 years ago when the original simple loop handle snapped off, a “china mender” fashioned a replacement handle, which was riveted to the body. 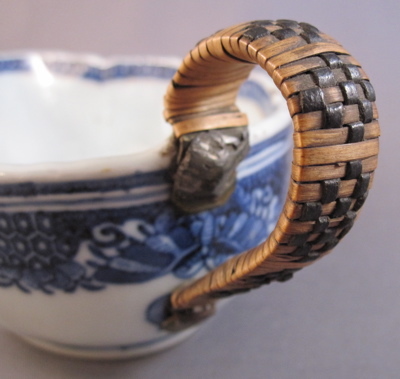 To help insulate the metal from the hot contents, rattan was wrapped and woven around the handle. This would have been one of a pair of matching sauce boats and was a part of a large dinner service. 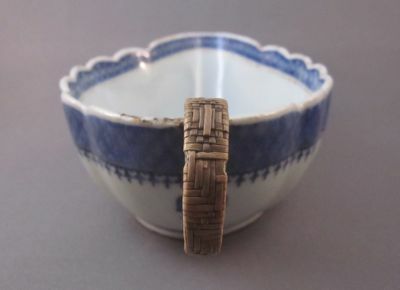 I wonder if it was separated from its mate and other “perfect” serving pieces, as was often the case. 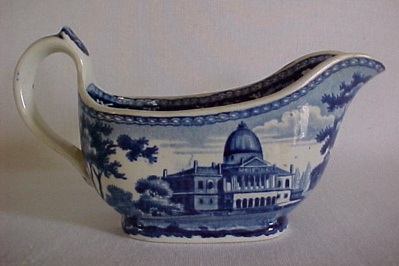 The original handle on this sauce boat, with identical form and similar decoration, gives you an idea of what the handle on my sauce boat would have looked like. 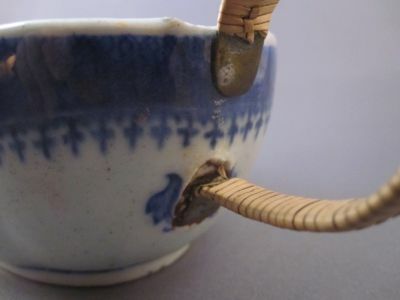 As collectors, we all have stories of “the one that got away” and for me it happened in June 1991, on the very first day I started collecting antiques with inventive repairs. 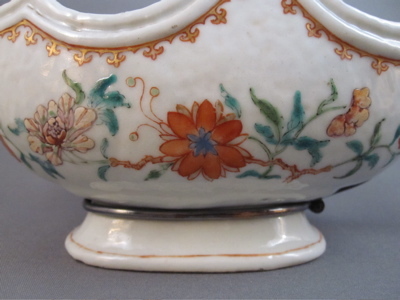 Having landed in London the night before and still jet lagged, I stumbled down Portobello Road and wandered into a crowded stall selling porcelains. 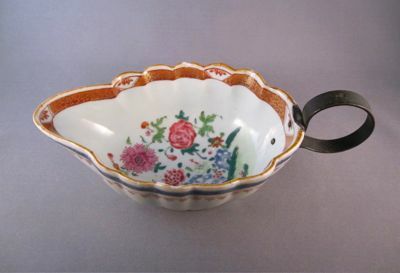 I spotted a pair of Chinese Export sauce boats each with a replaced metal loop handle. 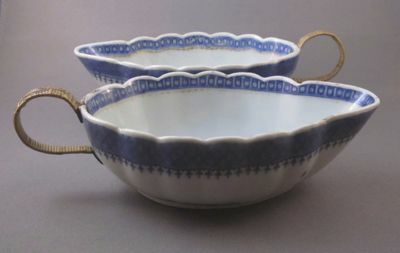 Pleading with the dealer to sell me just one, which I could barely afford, she broke up the pair and I happily walked away with what would be the start of my collection. Even then, I immediately regretted not being able to afford its mate, but I was pleased to at least own the one. To this day, I keep hoping I will come across the orphan I left behind and be able to reunite the two. So, if anyone can help me locate the long lost twin, I will be forever grateful and you will be rewarded for your excellent sleuthing! 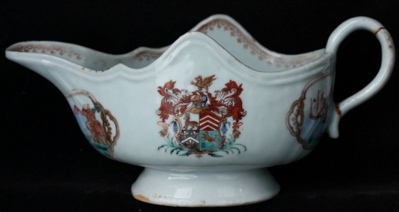 You can imagine how happy I was to have been recently contacted by dealer Polly Latham of Boston, MA, offering me a pair of Chinese Export sauce boats, each with identical replacement handles and decorated with an armorial coat of arms, no less. 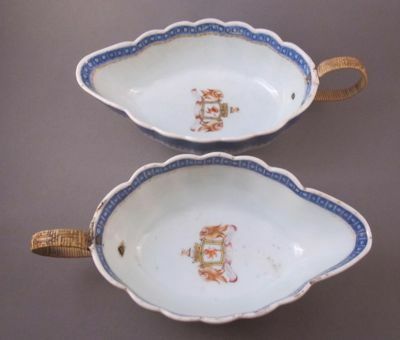 This pair, a part of a larger dinner service, was made for export to the English market at the end of the 18th century and bear the Arms of Maitland, 8th Earl of Lauderdale (1759-1839). Maitland, a noted statesman, politician and controversial social and political critic of his time, criticized the clergy, condemned slavery and was an ardent supporter of the French Revolution. 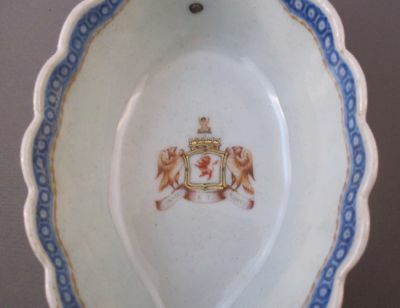 The motto under the coat-of-arms, intricately painted in polychrome enamels with gilt highlights, translates to “Wisdom and Courage”. 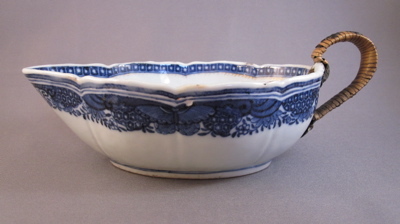 Each measures 2 inches high and 7.75 inches long. I am pleased to proclaim that as long as I am the caretaker of this fine pair, they shall remain unseparated. You can click here if you want more info. 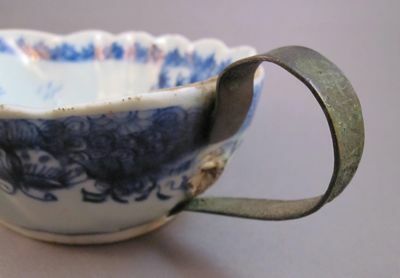 The replaced handles are made of forged brass, covered in woven rattan, and pinned to the end of the sauce boats with two metal rivets. 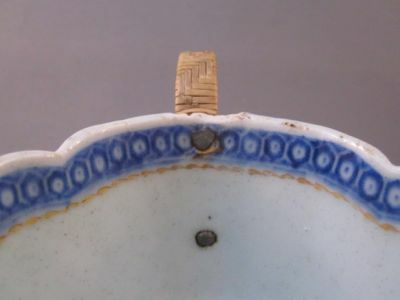 The rattan covering is not only decorative but also used to insulate the metal handle from the hot contents. 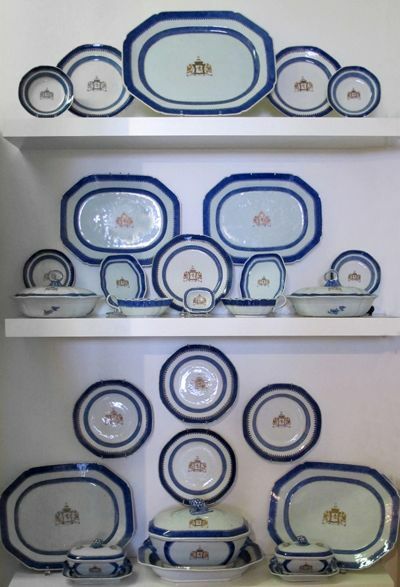 Take a look at the rest of the large dinner service, all bearing the arms of Maitland, including a pair of identical sauce boats with original handles intact, located in the center of the middle shelf. 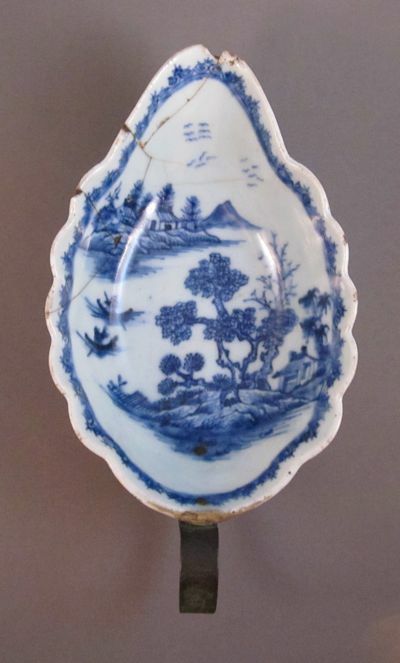 I have often expressed that I am a sucker for pieces containing more than one form of early repair and this little beauty does not disappoint, as it sports three separate repairs and a signature to boot. 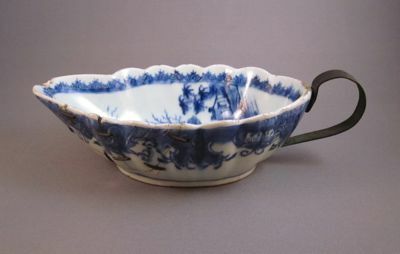 Chinese porcelain sauceboat, made for export in the mid-1700s, was originally part of a large dinner set consisting of up to dozens of place settings and serving pieces, including a matching pair of sauceboats. 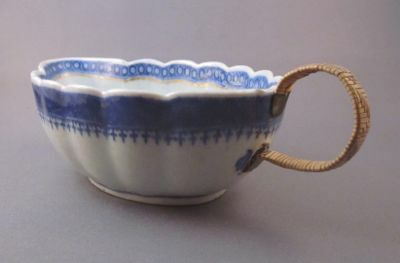 Painted with cobalt blue underglaze in the Nanking pattern, it measures 7-3/4″ long from end to end and is 4-1/4″ deep. 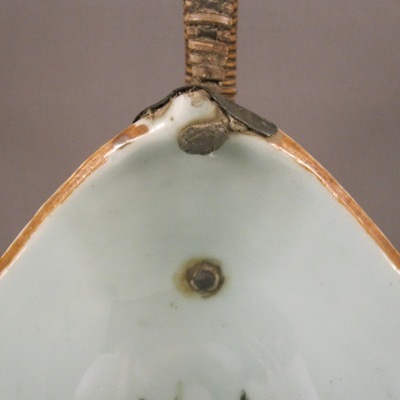 Repair #1: Metal replacement handle, which may have once been covered in woven reed, was riveted to the end of the sauceboat, echoing the loop form of the original. 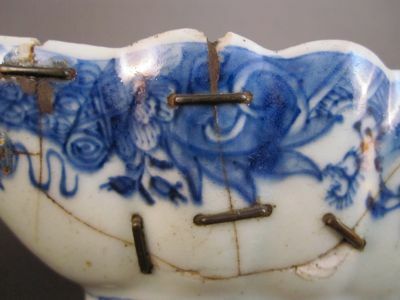 Repair #2: After the sauceboat was dropped a second time, an eighteenth century china mender carefully applied six 1/2″ staples to adhere the two large broken pieces near the spout. 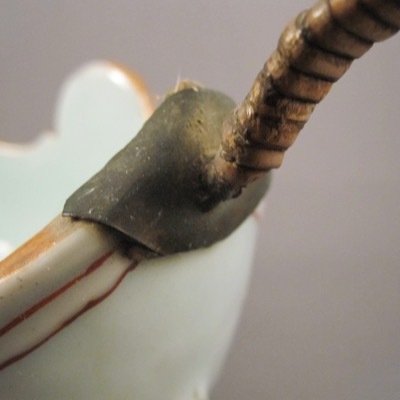 Repair #3: Three tiny 1/4″ metal staples affix another large piece which broke off at the end of the sauceboat. 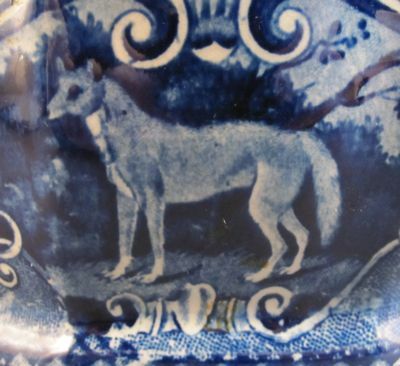 They were overpainted in blue to match the decoration and over one hundred years later have held up quite well. 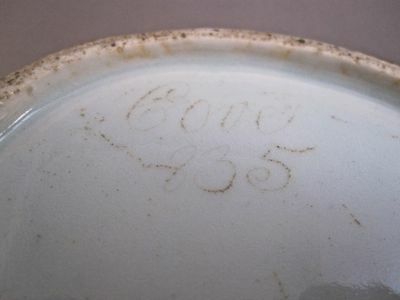 Etched on the bottom is “Cove 835”, which I am assuming is the mark of the china mender or tinker who was responsible for one or more of the repairs. 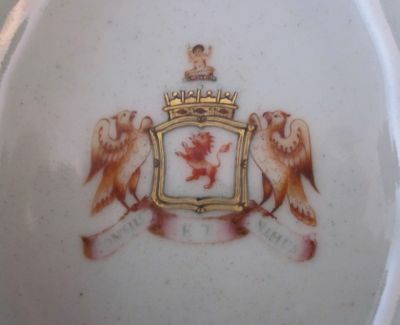 I have not been able to find out any information on this cryptic signature but will continue to search and I welcome information anyone can provide. 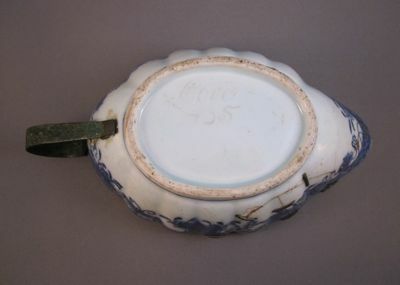 This porcelain sauce boat from the same period shows what the simple loop handle on my piece would have looked like, before the addition of the metal replacement handle. 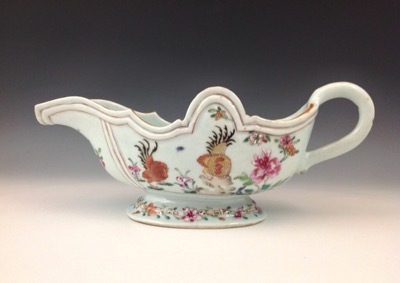 This large porcelain sauceboat was made and decorated in China and dates from the Qianlong period (1736-1795). 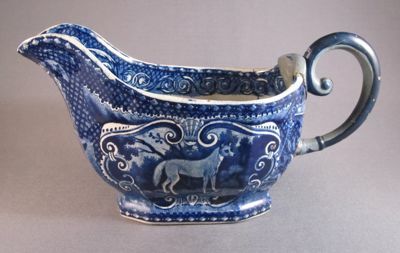 Sauceboats (aka gravy boats) were part of larger dinner services, exported to North America and Europe and snatched up by wealthy customers eager to display in their china cabinets. 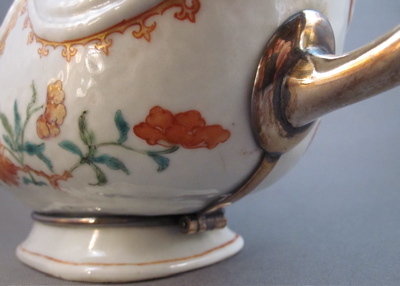 A skillful hand decorated the gravy boat with polychrome enamel flowers and an iron red border with gilt detailing. 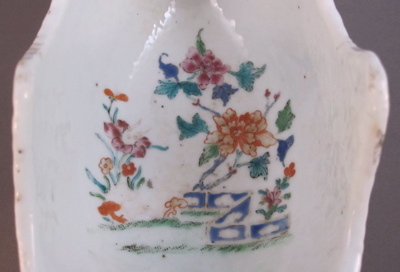 Even the interior is painted with peony flowers and a blue zig zag fence, visible once the last bit of gravy has been consumed. 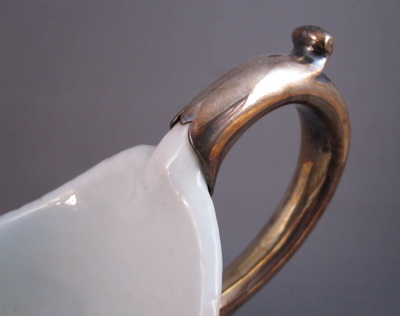 The broken handle has been replaced with an ingenious solid silver removable replacement, held together with screws and hinges. 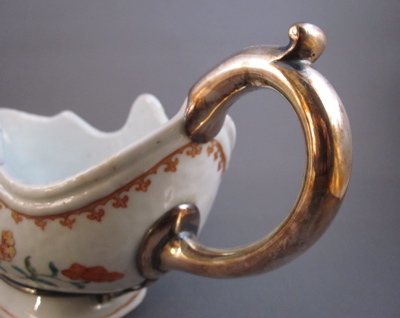 The craftsmanship is superb and unlike any other I have seen. 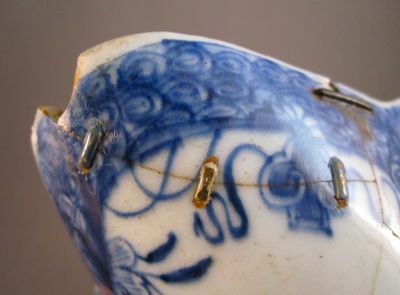 Only the wealthy would have able to afford this type of intricate repair, which keeps the body intact and without the intrusion of piercing rivets and bolts. 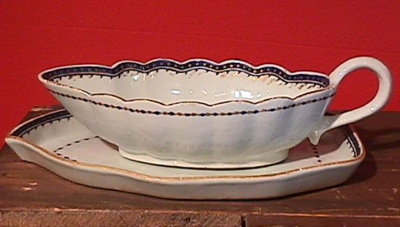 Sauceboat measures 4-1/2″ high and is 9-1/2″ long. 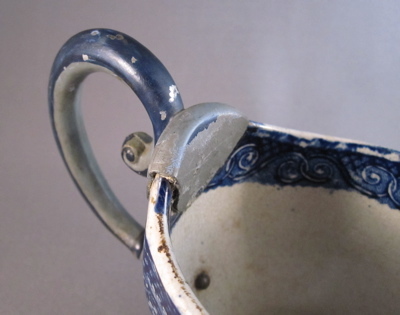 This shows what the simple loop handle on my similarly shaped sauceboat may have looked like before it broke off. 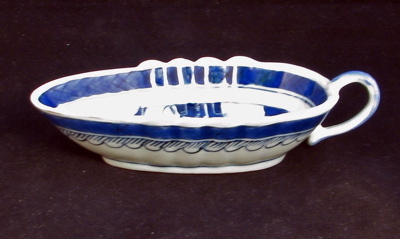 This wonderfully graphic pearlware pottery sauce boat was made by I. 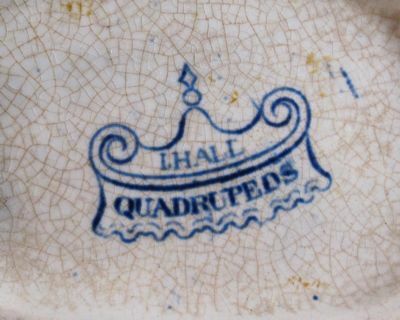 Hall in Staffordshire, England in the early 1800’s. 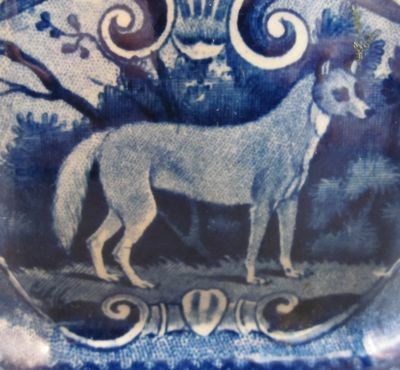 It has a dark cobalt blue transfer decoration in the “Quadrupeds” pattern featuring a fantastic fox on both sides. 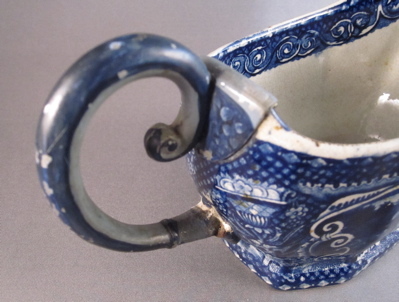 The replaced hollow pewter handle has been cleverly painted to match the decoration. 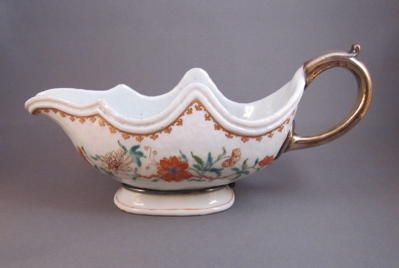 Sauce boat from the early 1800’s measures 3-7/8″ high, 7-1/2″ long. 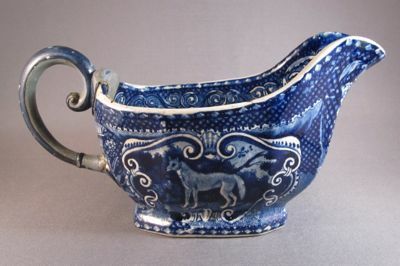 Sauce boat is boldly stamped in cobalt on the bottom I HALL, QUADRUPEDS. 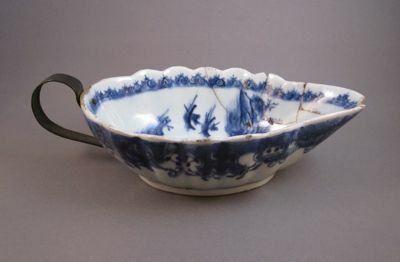 Another blue & white transferware sauce boat with its original handle. 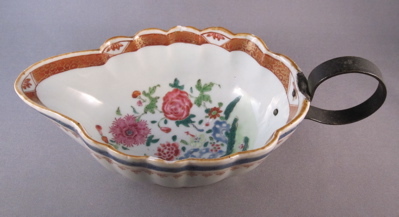 This Chinese porcelain sauce boat was made for export to the American market and has a distinctive Fitzhugh pattern outer rim border, and measures 7.5 inches wide, 2.75 inches high. 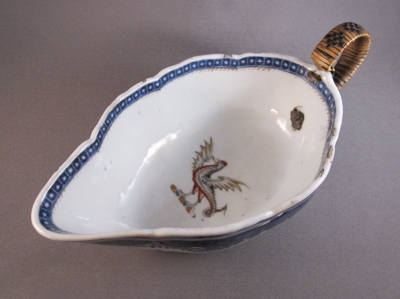 It bears an armorial polychrome enamel eagle/dragon, custom ordered by a family of wealth. 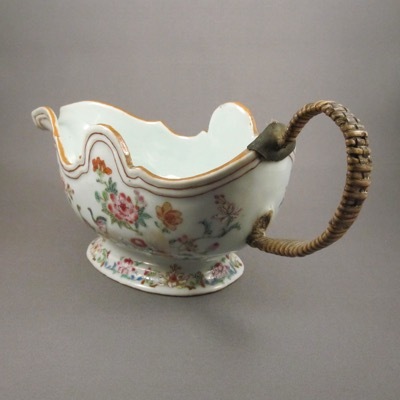 The replaced gilt metal handle is beautifully woven with two different colors of rattan.